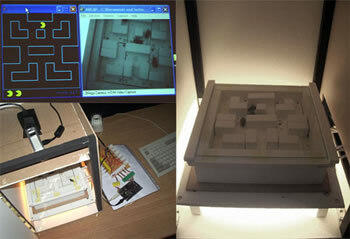 Animal Controlled Computer Games, a graduation project by Wim van Eck, is a Pac-Man-style game in which humans can play against real insects. The project has been written up in a short paper submitted to the 2006 International Conference on Entertainment. His project parallels part of the plot of Ender's Game, the Hugo and Nebula award-winning novel by Orson Scott Card. Most computer games today make use of pre-programmed behaviors, and are limited to what their programmers have created. As van Eck puts it "Donkey Kong will never get tired of throwing heavy barrels at you, or strain a muscle, or get hungry and just eat the princess. After playing a computer game for some time, you know what you can expect from it." The goal of his project was to center the action in a computer game around the unpredictability of an animal. Is it possible to replace code with creatures? Can a person play against an animal in a computer game? Instead of computer code, I wanted to have animals controlling the ghosts. To enable this, I built a real maze for the animals to walk around in, with its proportions and layout matching the maze of the computer game. The position of the animals in the maze is detected using colour-tracking via a camera, and linked to the ghosts in the game. This way, the real animals are directly controlling the virtual ghosts. Crickets were selected because of their small size, activity level and maintainability. van Eck makes use of a natural cricket behavior - a tendency to flee from vibration (a sign of approaching predators) - to allow human players to interact with them. For example, when Pac-Man eats a power pill, the ghosts run away. The real-world analog (for the crickets) is that the floor vibrates under the spot where the virtual Pac-Man is standing, causing the crickets to flee. Science fiction fans are immediately reminded of Orson Scott Card's 1985 classic Ender's Game, in which humans also play against insects (or, rather, insectile aliens). In the novel (*Spoiler Alert*), boy genius Andrew "Ender" Wiggin plays endless computer strategy games for the military. Eventually, he finds out that the "game" is a simulation of humanity's real battle against the insectile Buggers; he commands real troops and the "moves" of the aliens in his "game" are representations of the movements of the real insect battle groups. If we're going to fight insectile aliens, we certainly need to start somewhere; Wim van Eck's project is a fine beginning. Game enthusiasts may also want to read about Games of tomorrow built by players wiki-style; take a look at Rat Neurons In A Dish Now Playing Flight Simulator and Cockroach-Controlled Mobile Robot to see how animals can play their own games. Read more about van Eck's Pac-Man versus crickets game. Found on Pixelsix via pasta & vinegar.